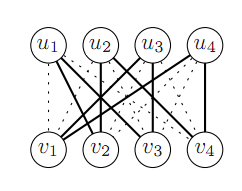 Below is an illustration of b-matching from (Huang,Jebara AISTATS 2007) paper. You start with a weighted graph and the goal is to connect each v to k u's to minimize total edge cost. If v's represent labelled datapoints, u's unlabeled and weights correspond to distances, this works as a robust version of kNN classifier (k=2 in the picture) because it prevents any datapoint from exhibiting too much influence. They show that this restriction significantly improves robustness to changes in distribution between training and test set. See Figure 7 in that paper for an example with MNIST digits. This is just one of a series of intriguing papers on matchings that came out of Tony Jebara's lab, there's a nice overview on his page that ties them together. Sometimes we are really wanted the improvement of our things but at the end of the period the things are like it was before. see more details to check out more helpful guide and tips for writing your papers. I would like to know about the improvement of knn and those factors which is really matter for such an imporvement. helpful link that is very helpful for the academic papers writing. I cannot even believe that these kind of things would have been happened in the seller function of the college in here. http://www.qualitativeresearchcritique.com/our-critique-services/ to see more about the writing tips. Better improvement we can do with this illustration and it will be good way to complete our task. I hope educators are also like this system and they can follow the http://www.doctoralresearchproposal.com/writing-a-dissertation-proposal/ for another guideline.